America’s Wild Horses are Facing Their Last Stand, and We Stand With Them. 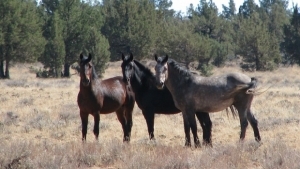 Our wild horses and burros are caught in a battle over the use of our federal and State lands and the distribution of the natural resources there. With no one profiting from their freedom, wild horses and burros have been systematically captured and removed from the American West in response to pressure from ranching, hunting, mining and other economically driven special interest groups. The protection and conservation of our natural resources is paramount to restoring balance on America’s vast rangelands, so that true preservation, within a truly wild environment, might one day be possible. 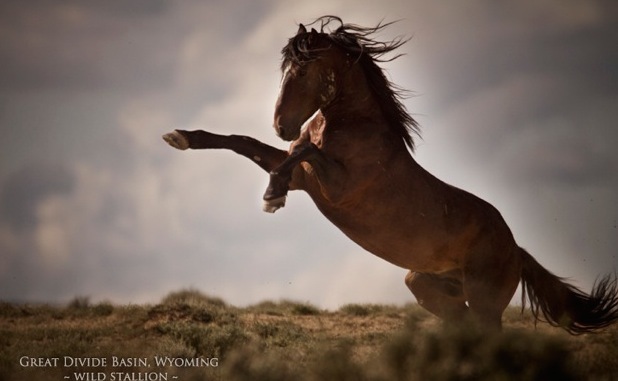 When necessary, Return to Freedom selectively litigates against actions which would set dangerous precedent to threaten America's wild horses and burros. Wyoming Checkerboard: We are continuing to fight along side the AWHPC and the Cloud Foundation in a legal battle over the removal of more than 1200 federally protected wild horses from 3 Herd Management Areas in Wyoming that span both public and private lands, creating a checkerboard area. It is our contention that the BLM ignored the Wild Free Roaming Horses and Burros Act when they bowed to pressure from private landowners who were part of the Rock Springs Grazing Association (RSGA) to remove “nuisance’ horses from their private lands. In doing so, BLM also captured federally protected wild horses on public lands. We have been in and out court throughout 2015 and will continue to challenge what we consider to be the unlawful removal of wild horses. 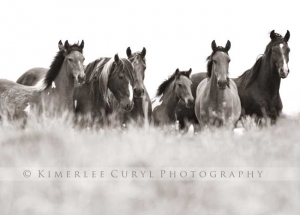 On Oct. 14, 2016 the 10th Circuit of Appeals ruled that the Bureau of Land Management in 2014 violated two federal laws, the Wild Free Roaming Horses and Burros Act and the Federal Land Policy Management Act, when it captured and removed 1,263 wild horses from Wyoming’s Checkerboard Region. That ruling came three days after the 10th Circuit upheld a lower court’s dismissal of a lawsuit filed by the State of Wyoming against the BLM, also in 2014, seeking removal of wild horses from public lands. On the heels of the Oct. 14 ruling, the BLM cancelled another roundup of 500 horses in the Checkerboard planned for this month. RTF is proud to share these victories with The American Wild Horse Preservation Campaign — which funded and did the heavy lifting in the 2014 cases — and fellow plaintiffs The Cloud Foundation, wild horse photographers Carol Walker and Kimerlee Curyl, and supporters of wild horses and burros like you. To read the full press releases about the decisions, please click here and here. Devil’s Garden, California. March 24, 2014 , Return to Freedom along with a coalition of animal and environmental groups filed a lawsuit in the U.S. District Court for the District of Columbia to stop the U.S. Forest Service from eliminating thousands of acres of protected territory and rounding up as much as 80% of the wild horses in the Devil’s Garden Wild Horse Territory in northeast California’s Modoc National Forest,(see press release here). The lawsuit asserts that the Forest Service’s decision violates federal animal protection and environmental laws and unlawfully prioritizes ranchers and privately-owned livestock above federally protected wild horses. Still Active/pending.